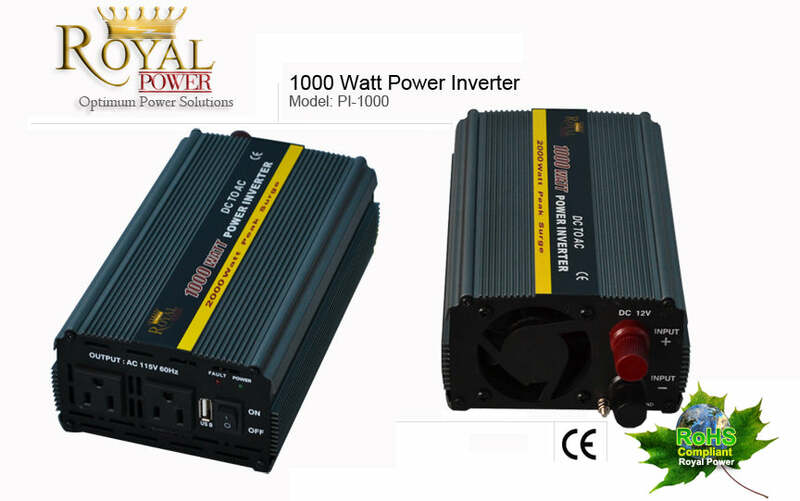 This (PI-1000) Royal Power power inverter takes direct current from a 12 volt battery and inverters the current into alternating 120 volt current. With 1000 watts of power you can operate a large ranges of electronics that require 8.4 amps of power or less. This modified sine wave power inverter can run all types of power drills, lights and small microwave ovens. With two standard ac outlets and one USB input this small but powerful inverter can really be used in a large range of applications. This inverter plugs directly to a 12 Volt DC battery to power large appliances, air conditioners, heavy duty power tools and many other electronics in your vehicle, or on a free standing 12V battery. This inverter also includes a USB port an excellent addition for battery chargers.